The first Sharknado mostly lived off its brilliant, original premise, the trashy charm, as well as that gobsmackingly dumb (in a good way) ending. The second one, inventively titled “The Second One”, was just as dull and unimaginative as that title suggested. They simply switched the location, and relied too much on cameos (of which most of them I probably didn’t recognize, since it was mostly US-C-celebrities) and on repetition (one chainsaw scene after another), instead of thinking up new stuff that would have been on par with the original. There were a couple of nice scenes and ideas scattered throughout, but overall, it was a lame sequel. Thus, I didn’t really expect much when I started my recording of “Sharknado 3: Oh Hell No!”. To my own big surprise, though, it actually ended up being the most entertaining one of the lot so far – thus, “Oh Hell Yeah!” would actually have been a more apt title ;). Like its predecessors, it’s not without its weaknesses, though. For one, Bo Derek – who still looks better, hotter and younger than her movie-daughter Tara Reid – is totally wasted. Seriously, what good is it to cast well-known faces if you don’t give them anything interesting to do? I really hoped for at least one badass moment, but unfortunately, it wasn’t meant to be. They also don’t make that much out of David Hasselhoff’s involvement. Granted, it would have been nigh impossible to better his appearance in “Piranha 3DD”, and just doing the same as they did would have been lame and unimaginative. Nevertheless, nothing that he does here comes even close to his great, self-deprecating performance in “Piranha 3DD”. He gets a couple of nice moments and a great final shot, but I couldn’t shake the feeling that they could have done more with him – and that the part or the movie didn’t really profit that much from his presence (compared to “Piranha 3DD”, which would have been only half as good without him). The CGI looks incredibly cheap and laughable (and as much as I get that this is part of its charm, I would love for SyFy to spend a couple more bucks on those effects, given the huge success of these movies). After a great, strong beginning, the movie slows down a little bit, and there are a couple of segments that I ended up being rather dull. The middle part feels more like one huge commercial for “Universal Studios Orlando” (with a short commercial break for Nascar thrown in for good measure) than a horror comedy. And even though they toned it down when compared to the second one, I still found the scenes with the moderators (this time seemingly from morning shows) rather unnecessary. Despite these flaws, “Sharknado 3” overall did a much better job to keep me entertained, than the last one. There are gags aplenty (none of which I want to spoil here), most of which hit home with me, and they thankfully also refrain from overexplaining them, like they did with the – otherwise cool – “jump the shark”-moment in the second one. I also liked the cameos in this much better than in the last one, where they relied too heavily on people that aren’t really known over here. This time, they picked more celebrities that even I recognized (even though I’m pretty sure that I still missed about half of them), and they even went international, including the german TV-moderators Oliver Kalkoffe and Peter Rütten of “SchleFaZ” (short for “The Worst Movies of All Time”). The best cameo, however, took place in a movie theatre. I wouldn’t even dream of giving it away, but it had me in stitches. “Sharknado 3” also does a better job of getting things going, and keeping me engaged. In the second one, the airplane sequence fell a little flat for me, but here, the beginning in Washington (after a brilliant parody of the James Bond gunbarrel sequence) was quite spectacular, and felt more like a finale than a beginning. To be honest, I was slightly worried that the rest of the movie wouldn’t be able to live up to that, but I was proven wrong. Over and over again, they managed to surprise me with imaginative, hilarious, over the top sequences, one funnier than the other, and ultimately culminating in the best birth scene ever seen on TV (sorry, “Sense8”). 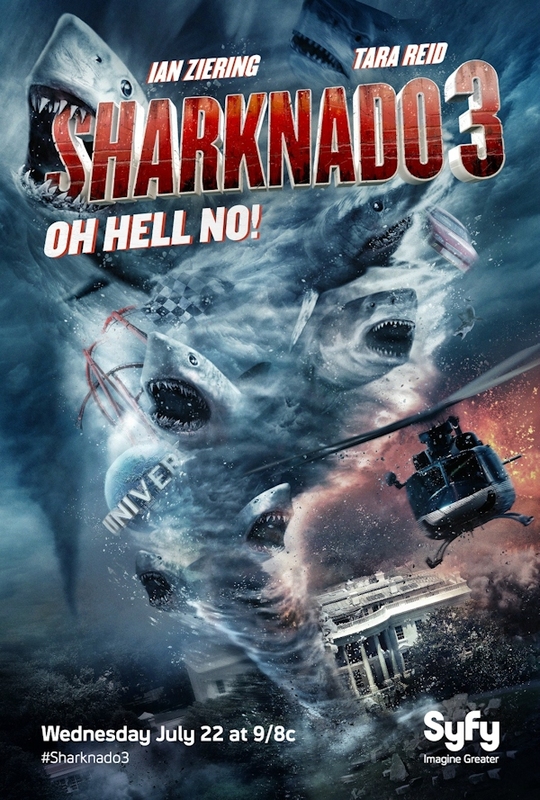 This, ultimately, is “Sharknado 3″s biggest achievement: Where the second one felt incredibly lazy, this time you can feel that they really put a lot of thought and effort into this movie, trying to make it as bonkers as possible. They also didn’t seem to hold back at all, rather throwing everything in there that they could possibly think of. Which, to be honest, now has me a little worried about the already announced forth one. However, if they should actually manage to keep this up, then I’ll gladly brave these Sharknados for as long as they keep making them. This entry was posted in movie reviews, new releases, What's on TV? and tagged Anthony C. Ferrante, Asylum, Bo Derek, Cassie Scerbo, David Hasselhoff, Frankie Muniz, Ian Ziering, Oh Hell No!, Ryan Newman, Sharknado, Sharknado 3, SyFy, Tara Reid, Thunder Levin. Bookmark the permalink.